"Sherlock Holmes: A Game of Shadows" promises to be bigger, better and more devious than its first salvo two years ago. With an antagonist that pits Sherlock Holmes' intellect equally, who could doubt that fact. But here's the thing, while the sequel does a lot more than its predecessor when it comes to being stylish and fun, it forgets what made the first one so good even perfect - and that is bringing depth and interest on how Holmes will connect the dots by the end of the film. Mind you though, the film is still a romp to watch even adding better segments than the first (and funnier ones at that) but there are also moments where everything feels forced, obvious and lacks that "wow" factor. The potential that the character of Professor Moriarty could have and should have brought in feels wasted. All around the globe, powerful and rich men are mysteriously killed one by one. 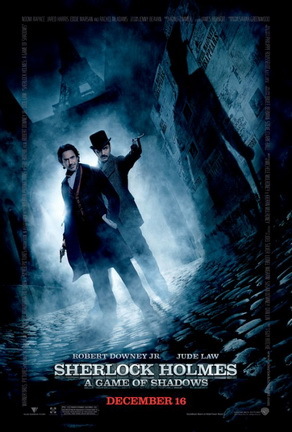 For everyone else, the deaths have no connection with each other but for Sherlock Holmes (Robert Downey Jr.), he believes that a single man is behind all the killings - Professor Moriarty (Jared Harris). Not only is Professor Moriarty Sherlock Holmes’ intellectual equal, but his capacity for evil, coupled with a complete lack of conscience, may actually give him an advantage over the renowned detective of Scotland Yard. When the two meet personally, they start a game, a deadly game that will not only involve Holmes' family and friends but also at stake is the risk of starting a world war. Almost everything in "Sherlock Holmes: A Game of Shadows" feels like a roid up version of the first one (emphasis on the almost because one thing was clearly left out). The action sequences are more epic in scale, the lines are wittier and funnier, the stand-offs between Holmes and Moriarty a definite favorite of ours and the "omniscient"-like analysis of Holmes when it comes to fighting baddies are more elaborate and complicated. In fact, if we can judge this film on visuals alone, the film would set the bar very high. Guy Ritchie did a great job on the cinematography once again by building up on what he started on the first film. Everything looks and feels so familiar but just simply bigger. As for the actors, every one did as expected meaning pretty damn good. Although we still had a hard time understanding Holmes' English. Where the film seems to falter is the plot and how everything eventually is revealed. It's not a bad story but it feels less intellectual than the first. Considering how Moriarty is supposedly as devious and smart as Holmes, we just felt a disconnection. Overall, "Sherlock Holmes: A Game of Shadows" is a pretty good try at a sequel. It's almost better than the first one but a simpler plot fails to impress us. - Guy Ritchie amps up the visuals and cinematography. This films is a beauty.